Health care has replaced the auto industry as Michigan’s job leader and nationwide, health care jobs are booming. 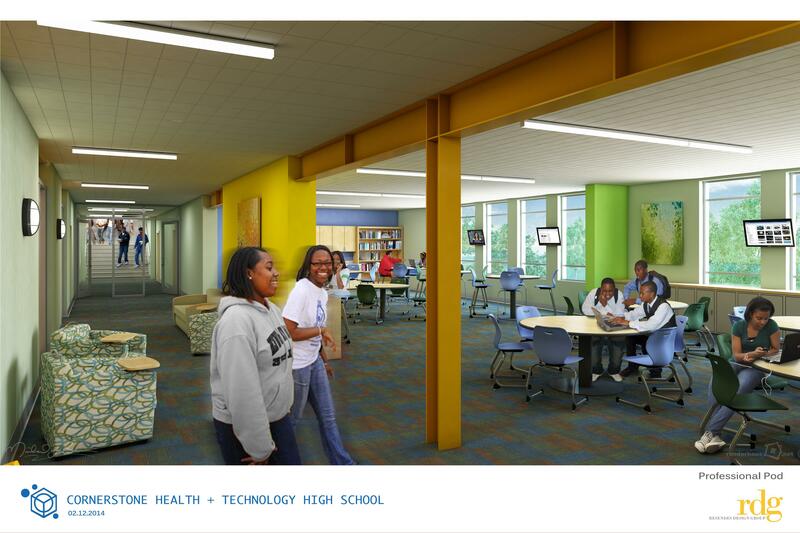 With the opening of Cornerstone Health + Technology High School, Cornerstone Charter Schools hopes to respond to that need while creating a unique high school experience that helps students understand how their studies will translate into real-world occupations. Their goal is to graduate accomplished and proficient students who continue to college or choose to pursue health related positions immediately after high school. To do so, they aren’t just rethinking the traditional school schedule. They’re getting rid of it. Gone are individual classrooms and instructors for core content areas. Instead, “pods” of 120 students work in a large open space in individual cubicles where they access personalized online content. Glass breakout rooms surround each pod where students receive face to face instruction that provide supplementation, remediation, or extension of learning opportunities. Gone are distinctions for “freshmen” or “sophomores.” Instead, student pods are grouped along a continuum from beginner to professional. To advance, students must be able to show mastery through standard assessments – like standardized tests or data harvested from online activities – or through real-world challenges and self-assessments. Virtual data dashboards provide anytime, anywhere access to student progress. Those dashboards are reviewed weekly with advisors (called “relationship managers”) to help students reflect on their work. Some students might move quickly to professional level and begin taking college coursework before graduation. Others might need more time as “intermediates” as they work to meet key competencies. Gone, too, are the standard schedules across grade levels. As students advance through key competencies, they begin to acquire new privileges that reflect their ability to take control of their own learning. A beginner, for example, may be assigned specific times to work on specific content in their cubicles or with peers in 90-minute blocks. As a student shows greater capacity for managing their own time and working through content, they are allowed to choose what subjects to study and when and where. An advanced student might work at home, in lounge areas at school, or at an internship outside the boundaries of the campus. Relationship Managers ensure students set and meet their daily, monthly, and yearly goals. Similar to a traditional guidance counselor, relationship managers follow a student from enrollment to graduation, helping students craft their individual learning plans and use student data and feedback to ensure students stay on track toward their goals. Relationship managers are the primary contact for parents and guardians. Relevance Managers provide direct instruction and support students in the design and evaluation of real-world projects and internships. Rigor Managers oversee online coursework, providing support and setting standards for mastery. Success Coaches work to help students make the transition to college and career, providing practical advice as students consider life after graduation. One of the most unique things about the school is its close partnership with the Detroit Medical Center (DMC), Beaumont Hospitals, and others. Throughout their academic experience, students are encouraged to explore health-related careers and competencies through projects, coursework, internships, and other real-world learning experiences. Cornerstone aims to create a blueprint for real world learning and intends to scale the model with different occupational themes. A new school, slated to open in 2016, will focus on technology and entrepreneurialism. Architect's rendering of "Professional Pod"